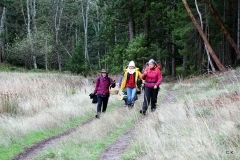 by Suzanne Fournier Editor’s note: Suzanne Fournier is a Galiano writer and Conservancy board member. Welcome Suzanne. 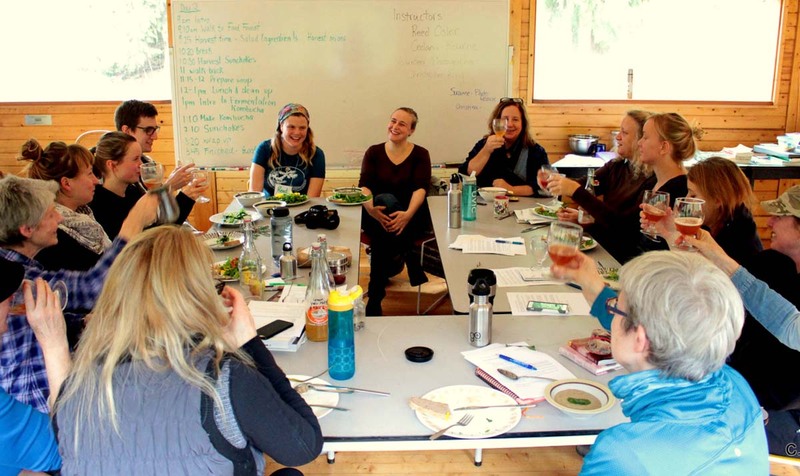 The 2016 Harvest and Herbal Workshop was a success! 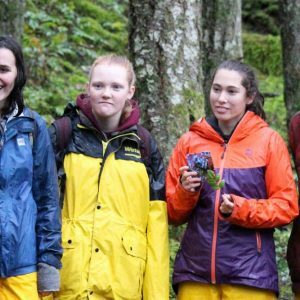 This mid-November weekend created a wondrous world of nature experience for 16 people of all ages. 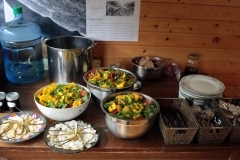 Coming from Finland, Germany, Vancouver, Galiano and other islands, participants all shared a keen interest in learning more about medicinal and edible plants as well as how to harvest, preserve and prepare a feast from wild and cultivated crops. 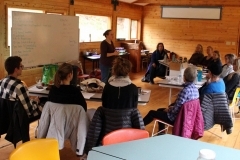 The workshop, hosted by the Galiano Conservancy Association, took place at the 188-acre Millard Learning Centre. 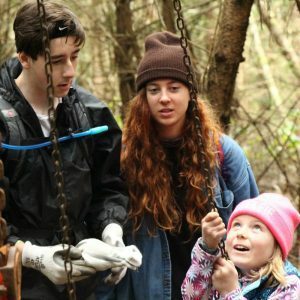 The magical site features over two kilometres of waterfront—the longest intact coastline in the Salish Sea— wetlands, two seasonal streams, 80 acres of mature forest, a recycled schoolhouse building and now the community-built permaculture garden or Food Forest. 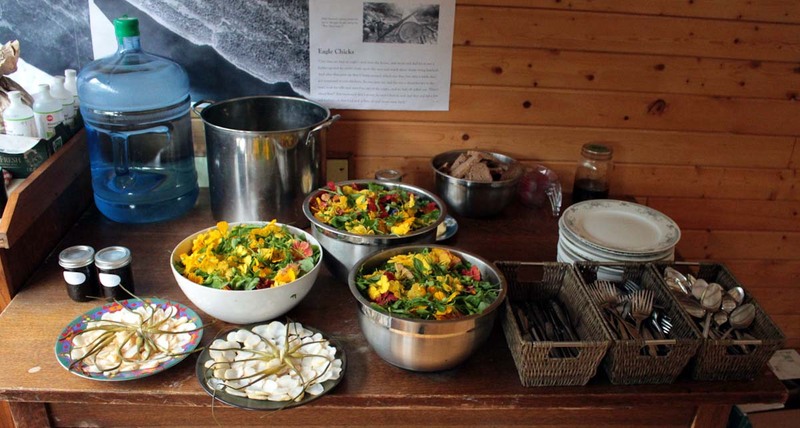 A remarkable amount of learning took place on two blessedly sunny November mornings, amid the camaraderie of a large group creating potions and a plant-based feast to share. Keeping the workshop on track and on time were our two focused and competent instructors. 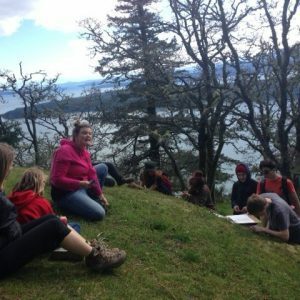 Reed Osler, a certified Community Herbalist and educator for the last 15 years, is the conservancy’s Education Coordinator. Cedana Bourne, GCA’s Agriculture and Nursery Coordinator, is an herbalist and registered Holistic Nutritionist who graciously shared her recipes and jars of preserved sunchokes and garlic scapes, along with bottles of her delicious kombucha. Perhaps most important of all, the workshop was a very hands-on format where participants learned how to make our own salves and liniments as well as how to harvest and prepare a wide range of fresh, fermented, salted and brined products, taking home not only our own creations but recipes to extend the growing season. 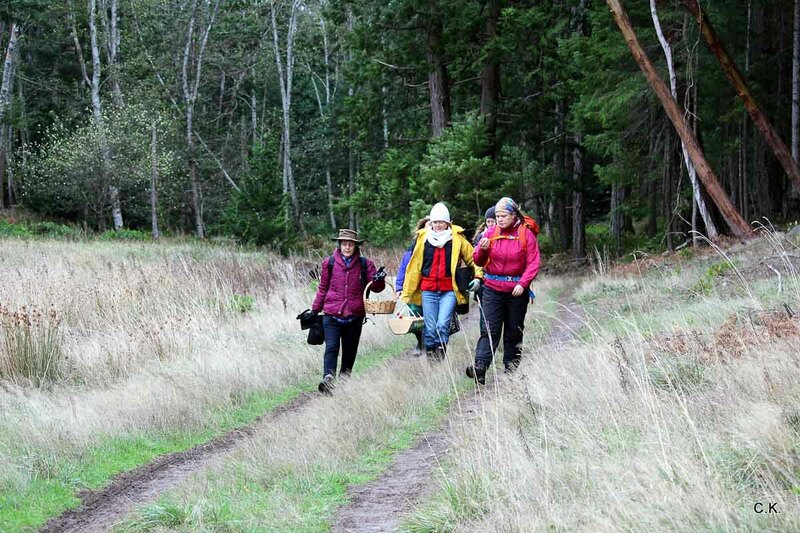 On the first day, participants gathered medicinal and edible plants as part of our hike and “forest bathing” along the stunning southern ridge of the MLC property, amid coastal Douglas fir, grand fir, alder, arbutus, cedar and Garry oak. 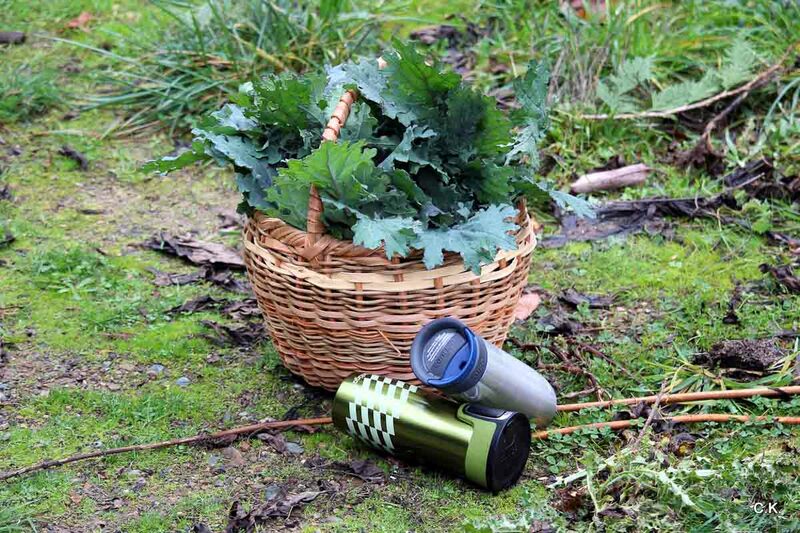 In the forest understory lurked harvestable jewels such as salal, yerba buena, self-heal, trailing blackberry, Oregon grape, evergreen huckleberry, plantain, sword and licorice fern. 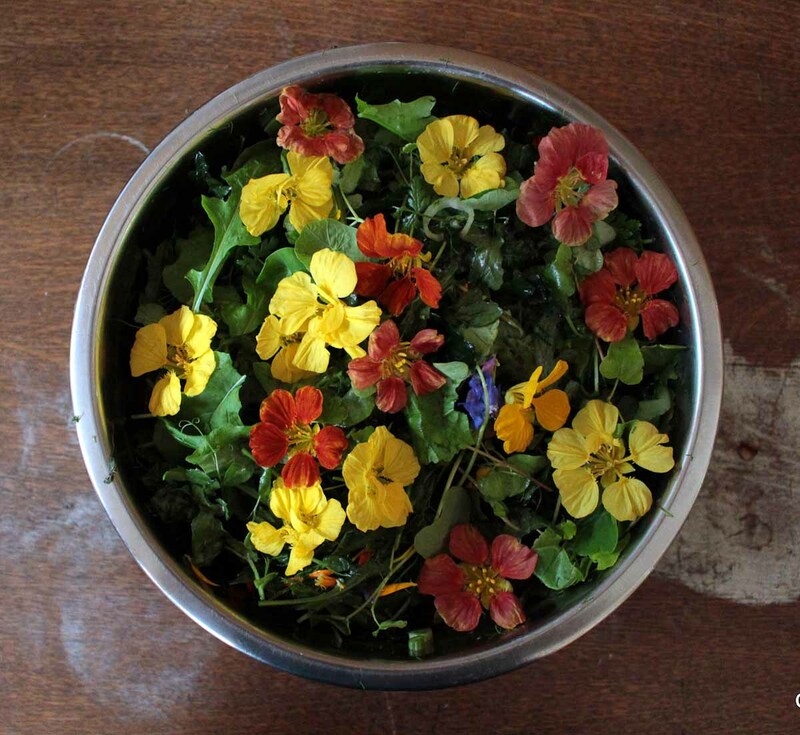 The group carefully picked small amounts of wild plants to make food and medicine, using the guidelines given for wildcra ing. 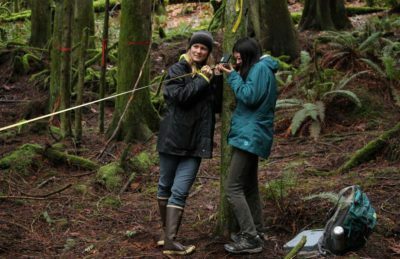 Accurate identification of a plant is key, including whether the plant is native, endangered, or growing in a sensitive environment. 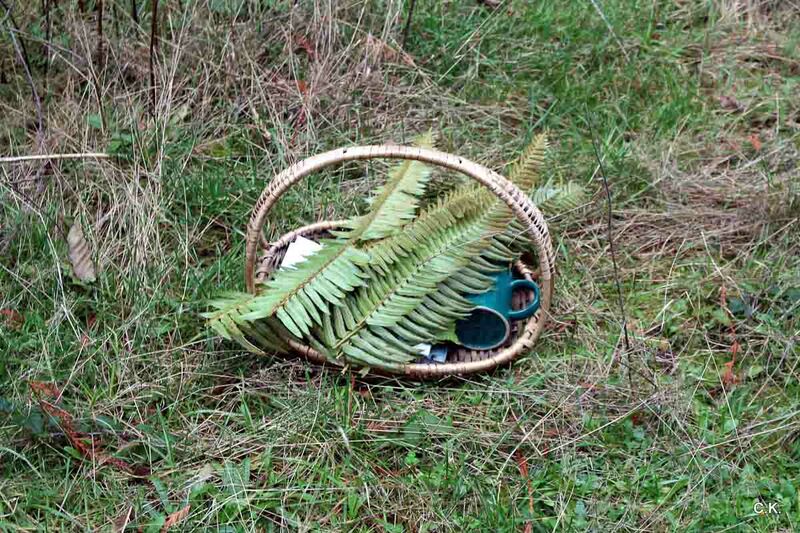 Leaving enough to share with deer, birds and insects, not to mention other wild cratters, is crucial. Avoid picking at polluted or roadside sites. 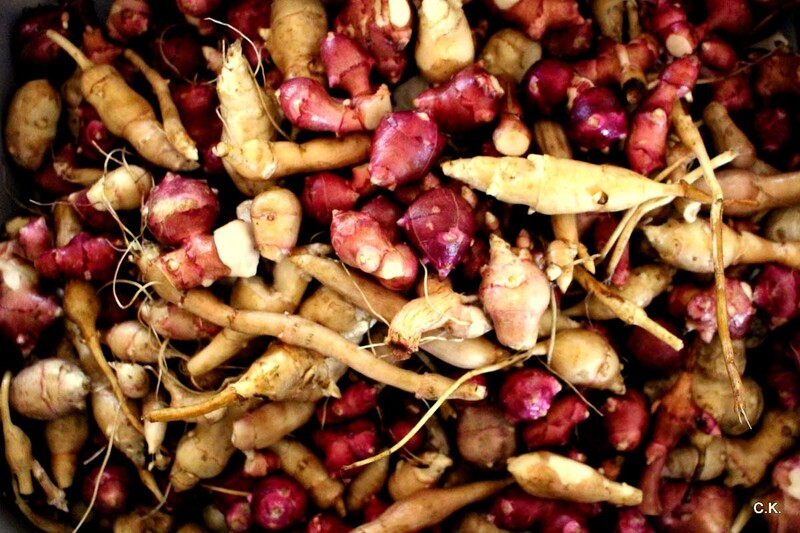 Targeting invasive or over-abundant crops such as blackberry or dandelion root is a good place to begin, and farmers may thank you. 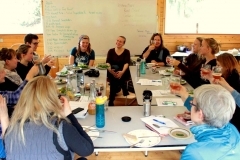 After our forest walk, the group sat down at the ocean cove in the sunshine to enjoy steeped grand fir and blackberry tea hot from Reed’s thermoses, along with homemade vegan cookies. 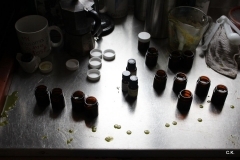 Back at the Learning Centre classroom, a buzz of activity began as we learned to create our own salves and liniments. 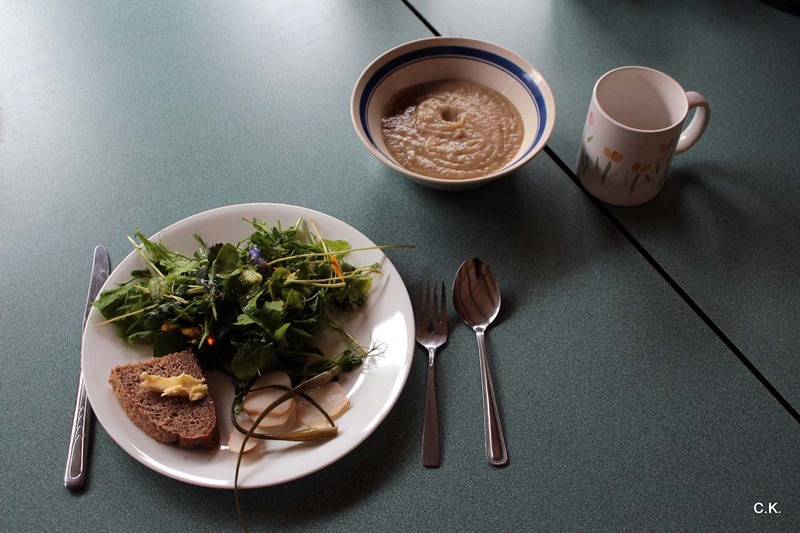 First we steamed ourselves over bowls of hot water filled with just-harvested cedar, which we learned is an excellent way to fight infection and stimulate the immune system. 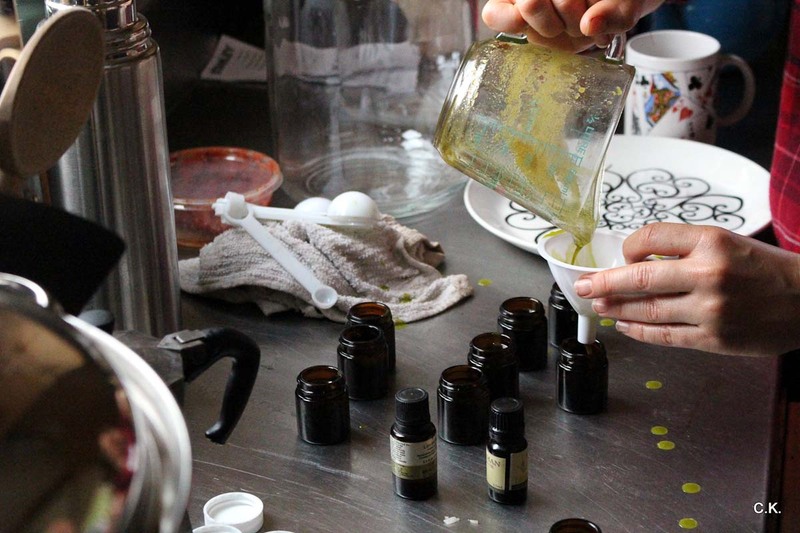 Reed and Cedana demonstrated how to make infused medicinal herbal oils, using grape seed, vitamin E and jojoba oil or the more affordable extra-virgin olive oil. 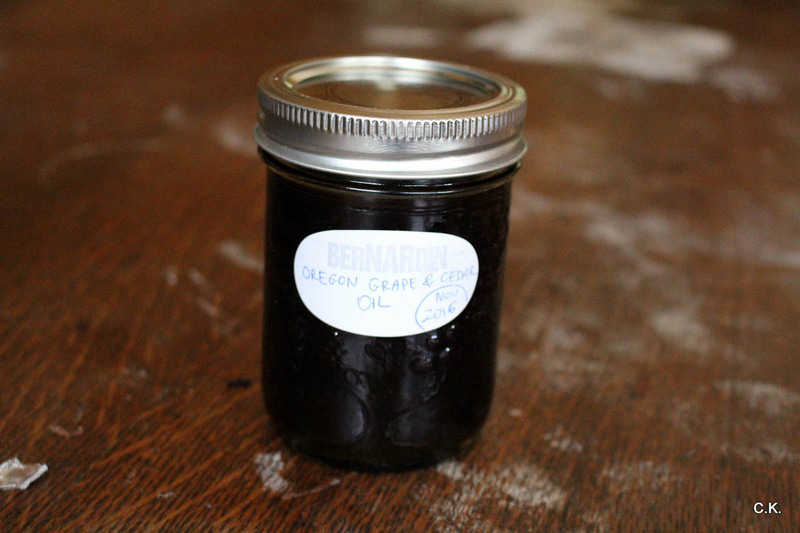 A blender was used to buzz (previously dried) Oregon grape and cedar oil until warm, then it was strained through clean muslin. We used the oil to make a lovely Forest Healing Salve by combining the warmed oil with beeswax. To complete the first day of the workshop, we also each made a small canning jar of liniment by carefully stuffng it with small alder twigs and newly-chopped swordfern, topped up by 99 percent isopropyl alcohol. 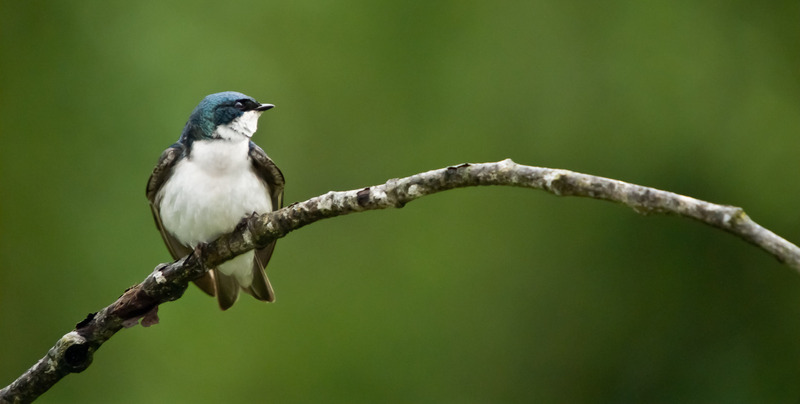 The next morning, one workshop participant said she enjoyed a wonderful painless sleep after her friend used the liniment on her chronically-sore back. 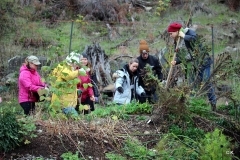 On Sunday, we set out with snips and baskets for the food forest, which is planted with many Hugelkultur no-dig raised beds brimming with food plant. 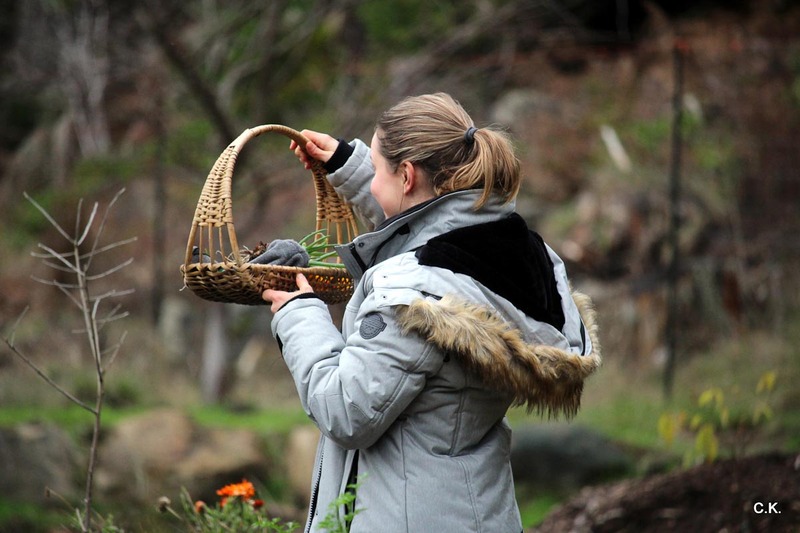 After our tour, we harvested a diverse list of plants. Back at the LearningCentre kitchen, everyone happily chopped, sautéed, stirred and eventually feasted on a delicious thick soup. 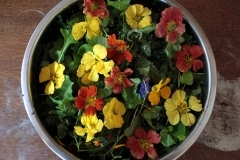 Big bowls of salad added more zest and biodiversity to our meal with arugula, pea shoots, buckwheat shoots, oxeye daisy greens, borage and nasturtium owers, for a truly delicious rainbow-coloured feast. 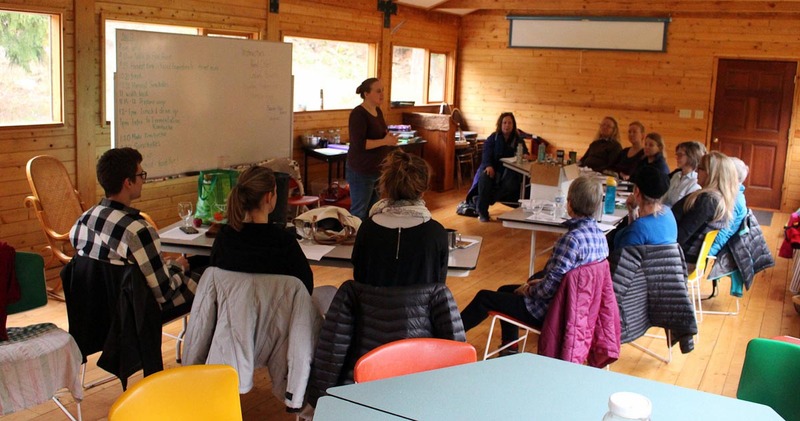 The final lesson of the workshop taught us to make kombucha, a tasty fermented and bubbly beverage loaded with enzymes, bacterial acids, antioxidants and glucosamines. 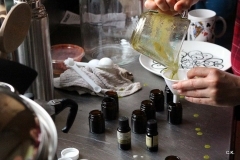 Cedana demonstrated how to make the popular tonic, providing each of us with the essential ingredient of a S.C.O.B.Y, which stands for Symbiotic Culture of Bacteria and Yeast. 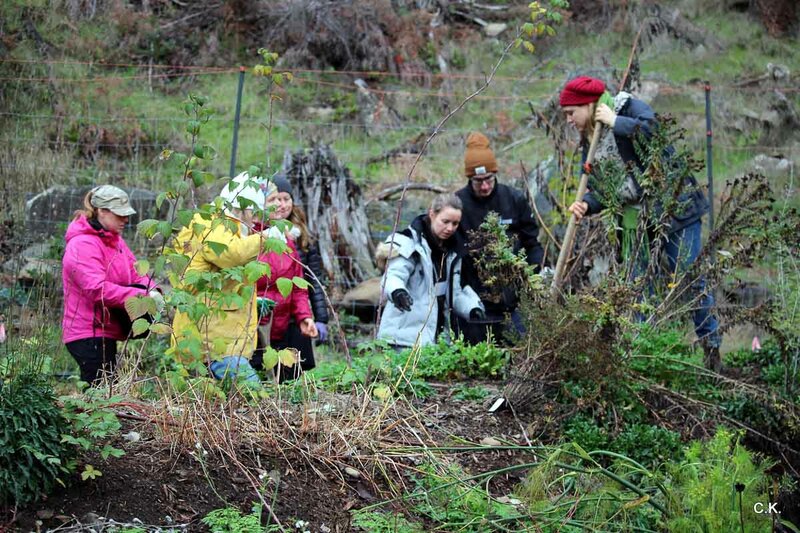 Sharing at the end of the workshop, Nicolina Kolster, trained in herbal aromatherapy in Finland, said she was “excited to learn how to use plants in the garden and from the wild, in so many ways.” Kolster and Lukas Traude, both 25, said they look forward to planting their own biodiverse garden. 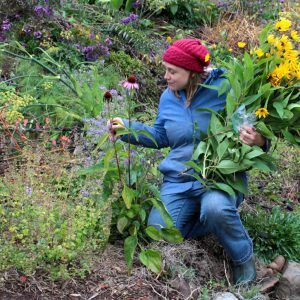 Galiano Conservancy director Julie Gardner, who is cultivating her own native plant garden near Retreat Cove, said she “loved that the common plants around my house are so useful— they contain riches beyond weeds!” And Galiano resident Jeanne Erickson said she had learned much about plants and permaculture to enhance her own usually solitary garden practice. Everyone agreed that harvest workshops at the Millard Learning Centre are an excellent way to learn—and feast. 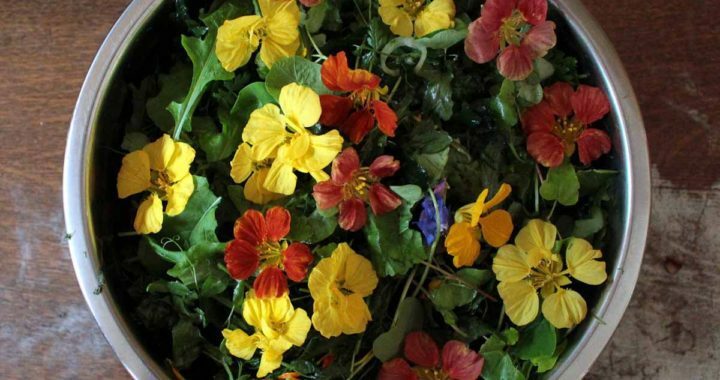 The 2018 Spring Harvest and Herbal Workshop will take place April 14 and 15. Sign up here! 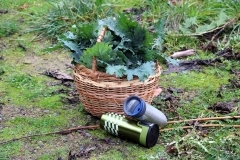 Posted in Event Spotlight, Learning Centre Updates, Slider and tagged harvest, herbal, medicinal, plants.